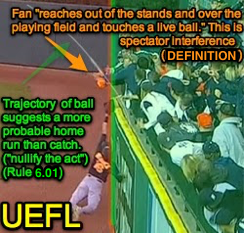 Let's clear up a myth: fan interference does not result in an automatic ground rule double call. By rule, the term "ground rule double" is reserved for a batted ball that goes out of play under one of the field-specific or Universal Ground Rules (e.g., a batted ball that lodges in the rotating signage along the first or third base stands is out of play due to a Universal Ground Rule. Thus, if a double is awarded due to this lodgment, it is a ground rule double). By contrast, a batted ball that travels over the outfield wall and out of play after bouncing once on the playing field is not actually a "ground rule double" but a "rulebook double" or "two-base award," as in Rule 5.05(a)(6) ("A fair ball, after touching the ground, bounds into the stands"); it's a double, but not because of the ground rules. Crew Chief Culbreth signals fan interference. The Play: With none out and none on in the top of the 4th inning of Thursday's Athletics-Mariners game, A's batter Bruce Maxwell hit a line drive down the left field line and toward the short wall separating the spectator area from the playing field. As the ball kicked along the wall, a fan reached out from the stands and onto field, whereupon his glove touched the live ball. With none of the umpires ruling the play dead for the interference, and batter-runner Maxwell winding up at first base, A's Manager Bob Melvin challenged the play, resulting in the rare overturned call where nothing of physical significance actually changes: Replay Officials overturned 3B Umpire Fieldin Culbreth's interference no-call, but opted to place Maxwell at first base. Related Post: MLB Instant Replay Review 454: Fieldin Culbreth (06) (6/6/14). The Broadcast: The A's broadcasters led off with this doozie: "The A's are saying that somebody touched it, which means it would be a double." Followed by, "That's a ground rule double, if he makes any contact." After the replay decision to keep Maxwell at first base on the interference, the broadcast debated whether the A's had actually won or lost the challenge. Fan interference's "nullify the act" penalty. The Rule: The definition of terms states that fan interference (aka spectator interference) occurs when, "a spectator reaches out of the stands, or goes on the playing field, and (1) touches a live ball or (2) touches a player and hinders and attempt to make a play on a live ball." Rule 6.01(e) specifies the penalty for fan interference as: "the ball shall be dead at the moment of interference and the umpire shall impose such penalties as in his opinion will nullify the act of interference. APPROVED RULING: If spectator interference clearly prevents a fielder from catching a fly ball, the umpire shall declare the batter out." Fan INT from the UEFL Video Rulebook. Analysis: As evidenced by the aforementioned rules, spectator interference is not an automatic double, and if a fielder is clearly prevented from making a play on a batted fly ball, the batter can even be called out. People have gotten thrown out because of this, even with Replay Review (MLB Ejection 101: Mike DiMuro (1; AJ Hinch)). To reiterate, under the "nullify the act" clause of Rule 6.01(e), umpires can place runners anywhere they feel is appropriate in order to rectify the non-natural occurrence of fan interference. 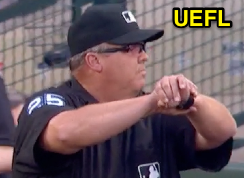 Especially in ballparks with foul outfield walls that jut out at near-perpendicular angles relative to the foul lines, this can result in a fan interference single if the umpire rules that, absent interference, the defense would have fielded the ball and held the batter at first base. Spectator interference can even result in a HR. 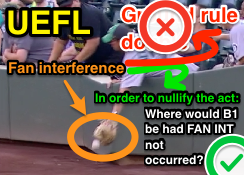 Under the "nullify the act" procedure, for instance, fan interference in the outfield can even result in a home run. Related Post: ALDS Game 4 (OAK-DET): The Fan Interference Home Run (10/9/13). MLB Network's World Baseball Classic commentators were no better in March, when Japan's Tetsuto Yamada hit a fly ball that was caught by a fan reaching out of the left-center field stands. In that situation, though, 3B Umpire Cory Blaser ruled that had the interference not occurred, Yamada would have achieved second base, and, thus, placed him at second. The broadcasters quipped that the call "cost Japan at least a base," claiming that Yamada would have had a triple if not for the interference. On the contrary, Had the umpires believed that Yamada would have reached third base safely if not for the interference, they would have placed him at third base. Related Post: WBC Replay Review - Blaser's Fan Interference (3/7/17). The final element here is the broadcast wondering whether Oakland won or lost its challenge, since nothing on the field physically changed (e.g., the runner remained at first base). Answer: The replay decision is considered an overturned call and a successful challenge. Replay Review Regulation I.B.1 states, "If the Replay Official overturns any call challenged by a Club (even if he upholds other challenged calls), the Club retains its Manager Challenge." Accordingly, the Replay Official upheld the runner placement call, but overturned the fan interference no-call.